SEVERE CLEAR: There’s nothing but sunshine across Alabama this afternoon with temperatures mostly in the 60s. Tonight will be clear and cold; most communities will see a low between 37 and 41 early Saturday morning. THE WEEKEND: Saturday will be another sun-filled day with a nice warm-up; the high will be close to 70 degrees. On Sunday, we project a high in the mid 70s with a partly sunny sky. Clouds will increase Sunday night. 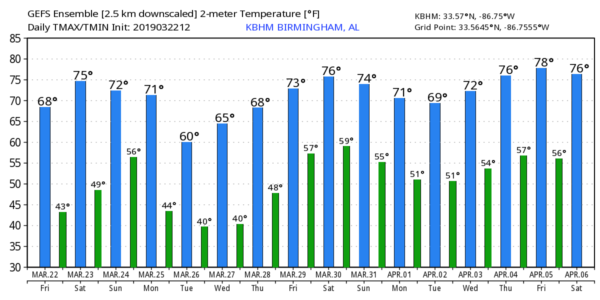 NEXT WEEK: The next rain producer for Alabama arrives Monday. Look for periods of rain and possibly a thunderstorm; rain amounts should be less than one-half inch, and we don’t expect any issue with severe storms. The rest of the week will be dry; cooler air filters into the state Tuesday with a high around 60, and we will be down in the 30s early Wednesday morning. Some of the colder spots could see another late-season freeze. Then, we will enjoy a warming trend beginning Wednesday afternoon. ON THIS DATE IN 1952: An EF-4 tornado developed near Massey in Morgan County and moved northeast, traveling west of Falkville and killing four people. Thirty-five homes were destroyed. SPOTTER TRAINING: We need more trained storm spotters. Will you help make the severe weather warning process more effective? Our annual spotter training is coming up Thursday, March 25, at the Pelham Civic Complex. There’s no fee and no need to register; just show up with a curious mind. You will never look at a thunderstorm the same. It begins at 6:30.